William Aric-Hall Ocker, son of Mike and Joshalyn Ocker, left this life and entered into the arms of Jesus on Sunday morning, October 18, 2015 in the Drumright Hospital at the age of 8 years. 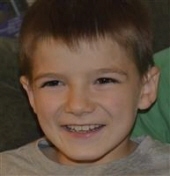 William was born on April 8, 2007, in the home of his great-grandfather, Gerald Hall. He was a boy that enjoyed life, always laughing, playing, and having fun with his brothers and sisters. He loved riding horses at The Right Path; swimming and driving his police car. Several months ago the “Make A Wish Foundation” honored him by sending him to Disney World where he got to meet “Woody”. William also got to swim with the dolphins during his visit to Orlando. William had a heart of gold; he was always thinking of others and he prayed constantly for his family and friends. William is survived by his parents, Mike and Joshalyn Ocker of the home south of Drumright; his siblings, Bryce Ocker and his wife Laci, Sarah, Abby, Sydnee, Sherrod, Elly, Selah, Wallace, Calvin, Knox, Adelina, Titus and baby Andrew; his grandparents, William and Donna Ocker of Oklahoma City, Bill Hall of Osage Beach, Missouri, Gaylynn Hall of Cushing, and Allen and Taresa Andrews of Atoka; his aunts and uncles, Sheli & Trey Thomas, Sunny and Ben McLernon, Michelle and Earl Christian, Kelia and David Crabbe and Lisa and Jeff Hacker, and other relatives, friends and church family. Funeral services will be held Thursday, October 22, 2015 at 3:30 p.m. at The Right Path with Pastors Phill Cochran and Kevin Bender officiating. Visitation will also be held at The Right Path on Wednesday evening from 6:00 p.m. until 8:00 p.m.
Memorial contributions may be made to “The Right Path”, “Hearts for Hearing” or to “Make a Wish Foundation” in his memory. To send flowers or a remembrance gift to the family of William Aric-Hall Ocker, please visit our Tribute Store. "Email Address" would like to share the life celebration of William Aric-Hall Ocker. Click on the "link" to go to share a favorite memory or leave a condolence message for the family.